One of the greatest successes of mankind over the last few centuries has been the enormous amount of wealth that has been created. Once upon a time virtually everyone lived in grinding poverty; now, thanks to the forces of science, capitalism and total factor productivity, we produce enough to support a much larger population at a much higher standard of living. EAs being a highly intellectual lot, our preferred form of ritual celebration is charts. 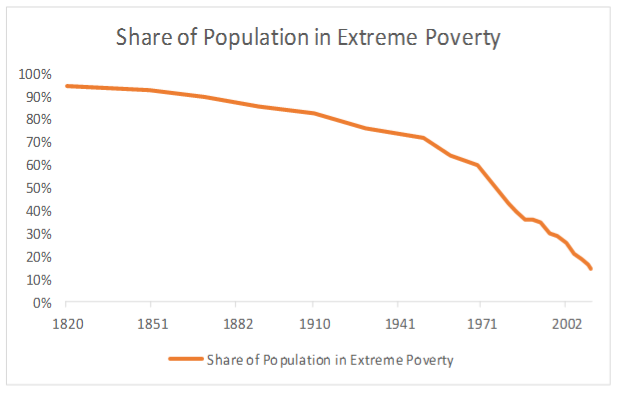 The ordained chart for celebrating this triumph of our people is the Declining Share of People Living in Extreme Poverty Chart. However, as a heretic, I think this chart is a mistake. What is so great about reducing the share? We could achieve that by killing all the poor people, but that would not be a good thing! Life is good, and poverty is not death; it is simply better for it to be rich. As such, I think this is a much better chart. Here we show the world population. 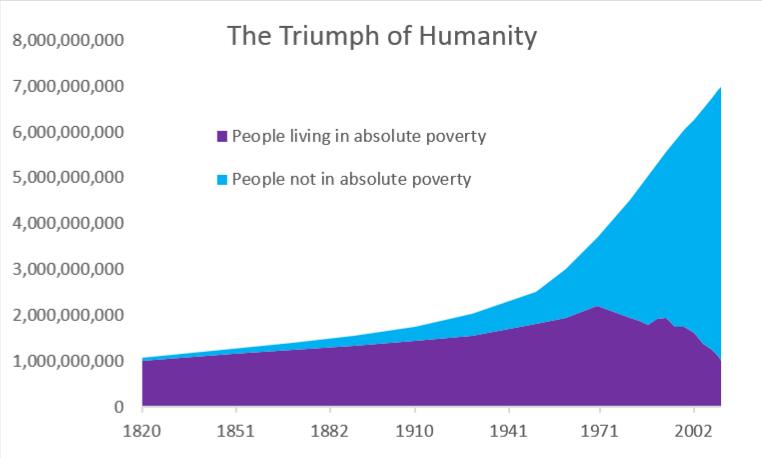 Those in extreme poverty are in purple – not red, for their existence is not bad. Those who the wheels of progress have lifted into wealth unbeknownst to our ancestors, on the other hand, are depicted in blue, rising triumphantly. Long may their rise continue. In a world with substantial population growth, the natural tendency is for capacity utilization to rise over time. We built enough machines to produce as much stuff as was demanded by a population of a certain size, but then the population grew, so now demand exceeds supply. This raises prices, and means it is profitable for businesses to invest in new equipment to meet the new demand. At this point, businesses will look at the different types of machine on offer, and go for the one that offers the highest return. If you can design a better machine, that either does more than the old ones at the same price, or does the same for a lower price, firms will buy your machine rather than the older designs. Without population growth this doesn’t work so well. With no incremental demand, the existing stock of machines is adequate for demand. Ignoring depreciation, firms don’t need any new machines. So to sell your new machine, you need to persuade a business that not only is your new design better than the old ones, it has to be a big enough improvement to justify the entire cost. In the population growth case, your design only had to be a little better, as businesses were in the market for a new machine anyway; now your design has to be good enough to justify getting rid of an old machine! It seems that the first world, with population growth, is more supportive of innovation than one without population growth. There is a common argument that a high population level is good for innovation, because it means there will be more scientists, engineers and entrepreneurs whose discoveries can be spread across everyone. The argument I just outlines is different, however, in so much that it relies on the rate of change, not the absolute level.